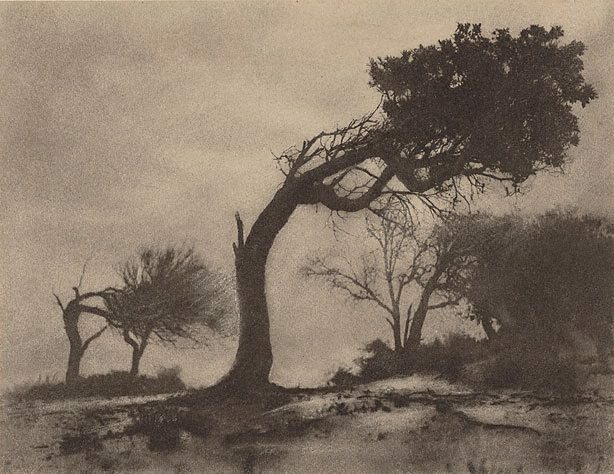 The bromoil process is used in The bent tree, Narrabeen to enhance the moody and stormy atmosphere of the scene. A bromoil print is created through an intervention in the printing process when a gelatin silver photograph is bleached and fixed, then soaked in water. A greasy ink is then applied and gradually built up to the required density 1. The suggestion of treacherous weather is reinforced by the two bent over trees in the frame. In 1914 the beach was yet to be considered a quintessentially Australian place of sun-kissed leisure2. Signed l.r. original mount, pencil "H. Cazneaux". Dated verso original mount, pencil "...1914". Heather Johnson, Celebrating Paradise - The artist and the Northern Beaches: 1890 to 2000 , 'Looking back - early artists of the Northern Beaches, 1890-1950', pg. 3-10, Manly, 1999, 3-4, 20.